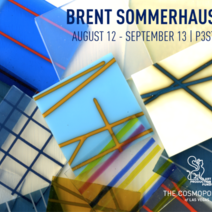 Originally from south central Kansas, Brent Sommerhauser holds bachelor’s degrees in fine arts and psychology from Emporia State University, Kansas and a Master of Fine Arts from The Ohio State University. He has taught there and at the College for Creative Studies, Hastings College, the Kansas City Art Institute, Pilchuck Glass School and was recently an Assistant Professor at the University of Nevada, Las Vegas. Sommerhauser's sculpture, glass and drawings often construe interaction between invisible forces and the evident world. He exhibits frequently via solo exhibitions and in national and international invitational exhibits, including the 2004 Windsor Biennial in Ontario, and in noteworthy publications, such as International Glass Art and New Glass Review 26, the Corning Museum of Glass’ journal highlighting innovative works in glass. A recipient of a Cirque du Soleil Community Support Grant for the Visual & Performing Arts, Sommerhauser was awarded the Nevada Arts Council 2012 Artist Fellowship.